CGPSC Admit Card 2019: Candidates can now download CGPSC Admit Card 2019 for the post of Assistant Professor on the official website @ psc.cg.gov.in. A direct link to download admit card is provided below. Once the same is out simply click on the link, and check for Assistant Professor Advertisement. Chhattisgarh Public Service Commission will soon be out with the CGPSC Assistant Professor Admit Card Release date and other updates. Please bookmark this page so that none of them are missed. We will keep adding all the necessary links, updates and the latest details right here. Also, there is a separate section available in the article that states “How to download Admit Card”. The selection method for 1384 vacancies includes an online examination and an interview. Applicants we receive call letter for online test. 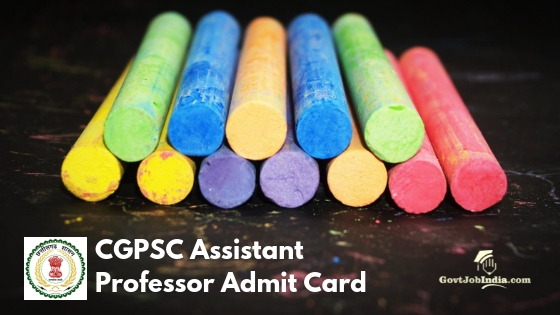 They will be duly notified by the regulatory authority to download CGPSC Assistant Professor Admit Card. Keep your registration details intact so that there are no issues in downloading the same. As of now, we have not received tentative dates regarding call letter. Soon after the online registrations or applications are closed applicants will receive notifications to download Chhattisgarh PSC AP Admit Card online. Kindly read the recruitment table mentioned below. It will help you to get a brief idea on the vacancy. The official website @ psc.cg.gov.in will soon declare details or dates regarding CGPSC Admit Card 2019 after online applications are closed. Please stay connected to this page and read the steps provided below. The steps are all about how one can download hall ticket online. After receiving the hall ticket please check that the details mentioned are accurate. They must all be the way mentioned at the time of online registration. Especially, candidate’s name, registration/roll number, date of birth, etc are to be given more significance. Do not forget to carry the admit card at the exam hall or you might not be allowed to appear for the test. Selection method for Assistant Professor Vacancy includes 2 rounds. Combined performance in both the stages will decide the final selection. Total 300 marks are allotted for the written online examination. It would be an MCQ test. Please check the official Pdf attached at the end to know the marking scheme. Apart from the MCQ test would be an interview. The interview comprises 30 marks. so, a total of 330 marks are considered for the final selection of candidates. Kindly note that there is a separate Annexure 2 that includes complete syllabus and important topics that will be covered in the online examination. How to Download CGPSC Assistant Professor Exam Admit Card 2019? Visit official website and search for option”other links”. A separate page will open with advertisements and notifications. Look for Assistant Professor Hall Ticket/Admit Card/Call letter. Click and download Call Letter. Save it offline and do not forget to take a print out. Carry the same to examination center and check all the details mentioned in the call letter. In case of any changes/mistakes get in touch with the authority as soon as possible. As soon as you receive notification about the CGPSC AP Admit Card click on the link provided above. It is a direct link to download call letter. In case if you have any questions or are confused about anything please enter your doubts in the comment section below. Our team will surely get back to you with relevant answers. To know more about Government job opportunities near you visit our website @ govtjobindia.com. You can also subscribe to receive latest job openings. All the best!